A root canal, also known as endodontics, is the removal of the tooth’s pulp which is a small, thread-like tissue in the center of the tooth. Endodontic therapy by Dr. Brion Weinberg near Palm Beach Gardens and Jupiter will remove the damaged, diseased or dead pulp and clean, shape or fill the remaining. This procedure seals off the root canal. Years ago, teeth with damaged or diseased pulps were removed. Today, at the Weinberg Dentistry near Jupiter, FL, we perform a root canal to save many teeth that would otherwise be lost. If the pulp becomes infected–or worse, dead–and is left untreated, pus can build up at the root tip in the jawbone, forming an abscess. An abscess can destroy the bone surrounding the tooth and cause severe pain. First, an opening is made through the back of a front tooth or the crown of a molar or pre-molar. After the diseased pulp is removed (know as a pulpectomy), the pulp chamber and root canal are cleaned, enlarged and shaped in preparation for being filled. If more than one visit is necessary, a temporary filling is placed in the crown opening to protect the tooth between dental visits. The temporary filling is removed and the pulp chamber and root canal are permanently filled at our office near Palm Beach Gardens. A tapered, rubbery material called gutta-percha is inserted into each of the root canals and is often sealed into place with cement. In certain cases a metal or plastic rod is placed in the root canal for structural support. In the final step, a dental crown is usually placed over the tooth to restore its natural shape and appearance. If the tooth is broken down to a great extent, a post may be required to build it up prior to placing the dental crown. With microscopic endodontics, we can offer our patients greater comfort and an even higher success rate. We can perform our root canals using microscopic technology that will ensure that the infection is completely removed and your tooth is completely treated and sealed. Microscopic endodontics allows us to see things that other endodontic treatments might have missed. To find out more about this revolutionary treatment, call us at our office today. 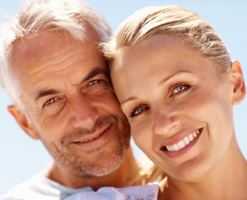 After endodontics, your treated and restored tooth/teeth can last a lifetime with proper care. Good oral hygiene and frequent dentist visits are necessary because tooth decay can still occur in treated teeth. There is no longer a pulp keeping the tooth alive, so root-treated teeth can become brittle and prone to fracture. Dr. Weinberg will take this into consideration when deciding whether to crown or fill a tooth after root canal procedure. Jupiter dentist, Dr. Weinberg compares the new X-rays with those taken prior to treatment in order to determine the success level of a root canal. This comparison will show whether bone continues to be lost or is being regenerated. Endodontics, or root canal treatments, is a great way to save a tooth that would have required removal years ago. 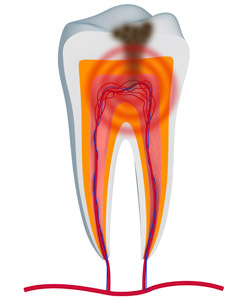 In fact, root canals are now the accepted and preferred way to treat teeth with diseased pulp. In the Jupiter and Palm Beach Gardens area, Dr. Brion Weinberg performs root canals at Weinberg Dentistry in Juno Beach. Call us today or fill out the form on this page to make an appointment and to learn if a root canal can help your situation. With the proper steps taken after endodontics and with follow-up visits you will be on your way to your new permanent smile.